Carr evangelism team got off to a racing start. On Saturday, 22 October around 80 men, who came for breakfast and to an exhibition of rally cars, listened to a presentation of the gospel. Sunday services were followed by a youth fellowship afterwards - the team answered questions about how the Lord had called them to College and about life at IBC in general. 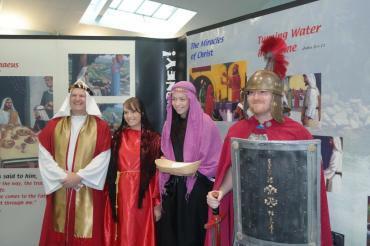 Part of our remit was to help Aaron Riddle and the Church present The Amazing Journey. We went to three schools and spoke to a total of 360 children. Our prayer is that this presentation will remind the children of the gospel as they grow up. A bridal event, organised by the ladies at Carr as an outreach, was very successful. It was well attended and a good way of building up new friendships, as was the fellowship night which included testimonies, songs and a closing epilogue. This was an encouragement to many in the church fellowship. On Wednesday, we had a quiz night and again many people came to this event. It was a memorable night - many who do not normally attend Carr came. Bibles, tracts and church literature were given out in the community. Students were encouraged to find that they were engaging with people who had a genuine interest in the gospel. Follow up details were passed on to the Church. The week finished with a youth event on the Friday night and we believe that the Lord was glorified in all that happened. We quickly became aware that Carr Baptist is a church that has community and outreach at its heart – their love shines through in all they do. Our hope and prayers are that many more people will be drawn to the church in the months to come.